If you happen to be near Stockholm tomorrow night (October 28) you can hear "The Garden of Adumbrations" (an anecdotal soundscape for 8.1 speaker system) as part of .microsound10years. This concert celebrates the anniversary of the .microsound internet list. The venue is Fylkingen, Münchenbryggeriet, Stockholm. This centre for new music and intermedia art is celebrating their 75th anniversary, so it's two parties in one! Doors open at 7.30pm and music starts at 8pm. There is a cash bar. Entry is 80 kr (students 60 kr). 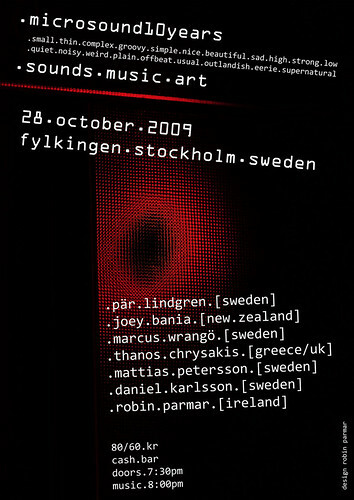 Mattias and Marcus will play live electronics. The other works are studio/tape pieces. Thanks to the curator Marcus Wrango. Details in Swedish on the venue's site.